The French and German economies both grew by 0.3% between April and June, bringing to an end year-long recessions in Europe's largest economies. Stronger exports and consumer spending, as well as government stimulus packages, contributed to the growth. The data came as a surprise, with few analysts expecting Germany and France to start to recover so soon. But economic activity in the eurozone fell by 0.1%, showing the region as a whole is still in recession. It was the fifth consecutive quarter of economic contraction in the eurozone, but was a marked improvement on the 2.5% drop recorded in the first three months of the year. Germany and France can now say they are technically out of recession, while the UK is still in it. The UK government's claims that it is a global recession maybe rings a little less true in terms of the mood music from each country over the last couple of days. We've had the French finance minister hailing the figures as a sign of recovery and more optimistic noises from the US Federal Reserve. Yet at the same time the governor of the Bank of England has said the recovery in the UK will be slow and protracted. The key question now is whether, over the next year, the UK is going to be helped by Germany and France or held back by things like household debt and the state of our banking system. Q&A: Why are France and Germany out of recession and UK is not? Markets reacted positively to the news, with the main German and French markets up more than 1% at midday before later dropping back slightly. In London, the FTSE 100 index also rose, with traders anticipating a positive effect on the UK economy, which by contrast shrank by 0.8% in the second quarter. Asked about why the UK seemed to be lagging behind, Business Secretary Lord Mandelson said: "Different economies will show different patterns of behaviour." "But the key point is all these economies rely on each other; 55 to 56% of our trade is with the rest of Europe. So when [they are] recovering that is good news for our manufacturers and our exports here." France and Germany may have been less hard hit than the UK by the global economic slowdown because their financial sectors, which were at the heart of the crisis, account for a smaller proportion of their economies. Germany was thrown into recession earlier in the year because its exports collapsed. 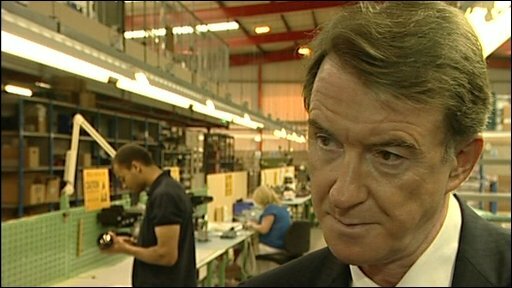 Peter Mandelson: "The outlook for our own economy is also strengthening"
The latest figures showed German exports had grown at their fastest pace for nearly three years at 7%, with particularly strong growth in demand from rapidly-growing economies such as China. The country's Federal Statistics Office said that household and government expenditure had also boosted growth. It added that imports had declined "far more sharply than exports, which had a positive effect on GDP growth". "These [GDP] figures should encourage us," said Germany's Economy Minister Karl-Theodor zu Guttenberg. "They show that the strongest decline in economic performance likely lies behind us." 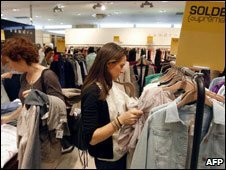 Reaction among analysts to the signs of Germany's recovery, however, was mixed. "The recession has ended, and it has ended sooner than we all thought. We expect to see growth of 1% in the third quarter, which is very strong for Germany, and I wouldn't rule out the chance of even better growth," said Andreas Rees at Unicredit. But there are concerns that the banking system across Europe is still fragile and that the growth is reliant on government stimulus spending that will eventually have to come to an end. BBC Europe business reporter Mark Sanders said that although the surprise news was highly welcome for those that have been suffering, there were questions about how strong and credible the economic recovery is. "To draw a medical analogy, we've got the patient waking from a coma and talking to medical staff," he said. "They're not necessarily going to be running any marathons soon." In France, economy minister Christine Lagarde said: "The data is very surprising. After four negative quarters France is coming out of the red." Ms Lagarde said that consumer spending and strong exports had helped to pull France out of recession. Chief executive Ulf Sauerwald says his business is growing. Orders are rising and it is taking on more staff. "Turnover in the whole group increased from 15 to 20% at the start of the year. We've had major new orders coming in, have developed new products in the car sector and are planning to open a new factory in Spain," he says. But the workers on the factory floor are not seeing a recovery yet. "It is tough right now... we don't get paid overtime and don't buy expensive stuff like cars," says employee Christopher Schmidt. "What we see is that consumption is holding up," she said. Official figures showed that household consumption rose by 0.4% in the second quarter. She said government incentive schemes for trading in old cars, together with falling prices, were helping consumers. Foreign trade contributed 0.9% to the GDP figure - a "very strong impact", said Ms Lagarde. "[The figures are] a positive surprise, as many people were expecting slightly negative numbers," said Marie Diron at Oxford Economics. But she warned that growth was "still very fragile". "Investment is down, we still have surprisingly low stock levels, and growth is boosted by the fact that imports fell sharply," she added. Recovery is expected in 2010, the OECD says. Stimuli and deficits: Who has spent the most? Can GM crops cure India's food shortages?